The Perfect Tow Vehicle is bumpety-bumping over deep ruts and sandy washes. 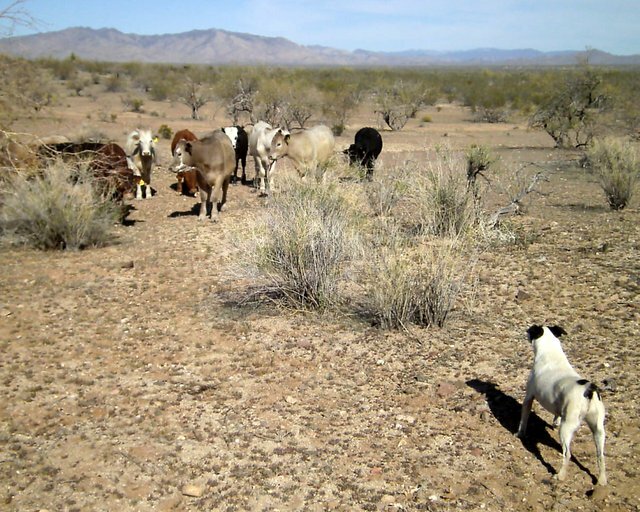 We’re on our way back to a new camp on Bureau of Land Management acres between Wickenburg and Congress in central Arizona. I’m hunched over the steering wheel navigating the hills and valleys in the lane. I hope nobody’s moved into Al and Kelly’s spot. It’s the best camp for miles around. What a view of the desert and mountains! In the middle of my self-absorbed ruminations, I see the black horse! Funny how once you stop searching, you find what you're looking for! She’s right alongside the lane. I stop the PTV, grab my camera, and jump out. 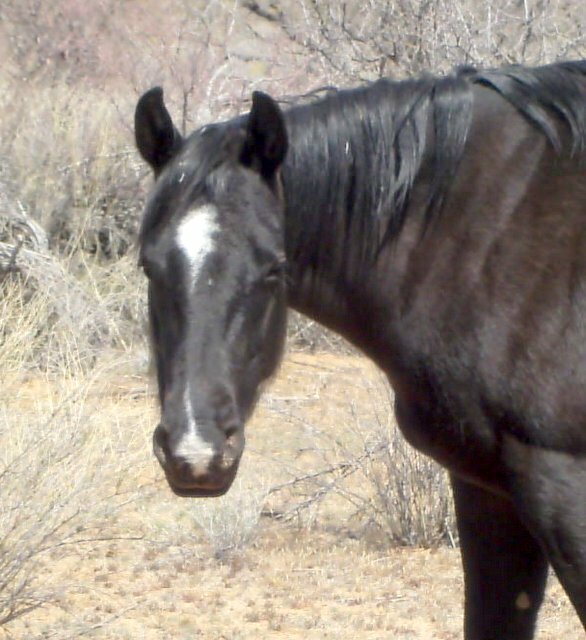 The horse is calmly munching desert grass. She briefly looks up at me, shows no reaction, and goes back to grazing. I look around and see the gray! This one's a beauty, too! 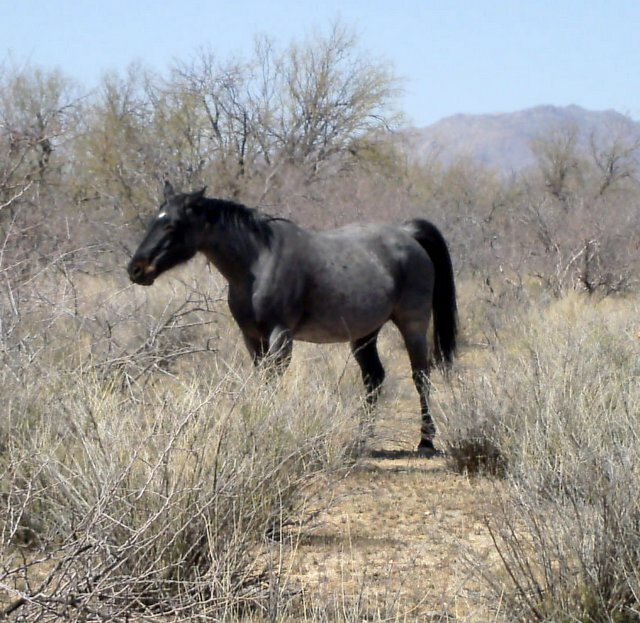 Then the magnificent head of a white horse appears from behind a thicket of palo verde and brush on the bank of an arroyo. He whinnies to the gray and the black. The black lifts her head and whinnies a reply. A roan with white face appears alongside the white. The gray and the black join them as others come up out of the wash. They quietly follow the white off into the deeper brush where I dare not follow. I only get a brief glimpse of their heads and backs as they move through the tall bushes. The crew and I are returning from a visit to North Ranch. We’ve got empty waste tanks now and a full fresh water tank. I park the BLT so the door opens on an expansive view of desert and mountains. There’s a mature palo verde to sit under. Al and Kelly left a neat, well dug, fire ring with wood and kindling nearby. The PTV is unhooked and the BLT is level. Later I find out that the Casita’s antenna picks up eleven television channels and the Verizon signal is still strong like at our former camp down the hill. It’s 82 degrees this calm afternoon. The sky is blue. No complaints from me! Spike and Bridget apparently approve of our new homesite, too. They both give it a sniff inspection, lie down on their sides in the dirt, and take a snooze in the sunshine. Later two white pick-ups drive up. It’s the rangers. A uniformed woman approaches, introduces herself, and asks how long I’ve been here. I tell her “about a week.” She asks, “Where in South Dakota do you live?” She also requests to see my driver’s license. I can see I’ve got some explaining to do, what with me standing here in Arizona with tags from South Dakota and a driver’s license from Georgia. My story satisfies her and she goes back to one of the pick-ups to write up my permit. Meanwhile the tall dude in uniform walks up to me. He doesn’t introduce himself. Uh-oh, bad sign. He’s looking at the pile of wood next to the fire ring. “You’re not supposed to cut wood,” he states flatly. “Uh, that was here when I got here,” I respond. “I just moved up here from a camp down the slope over there.” I point off into the desert. We do not exchange eye contact. He recites the rule, “You can gather wood but you can’t cut it,” then turns and walks back to his pick-up. Geez, can I relax now? The female ranger hands me a permit allowing us to stay here until March 25th. I ask her about fire restrictions and she tells me there are none, and probably won’t be any for a while. “Usually fire restrictions don’t begin until June,” she explains. Wishing me an enjoyable stay, she returns to her pick-up and the two drive off. Whew! I walk over to examine the pile of wood. There’s one cut branch. The cut end is dark from weathering, apparently having been cut quite some time ago. I wonder about the rangers. What was that . . . good cop, bad cop? Is one experienced and the other a trainee? And which is which? Hmmm . . . .
Several cattle make their daily visit. Young bulls eyeball our camp. Spike seizes the opportunity to throw his weight around. "Get out of here or I'll . . . I'll . . . The cattle aren’t impressed and take their sweet time leaving. I’m debating whether to grill chicken tonight or simply finish up the tuna fish salad. This weighty decision is the biggest mental strain I’ve had all day. 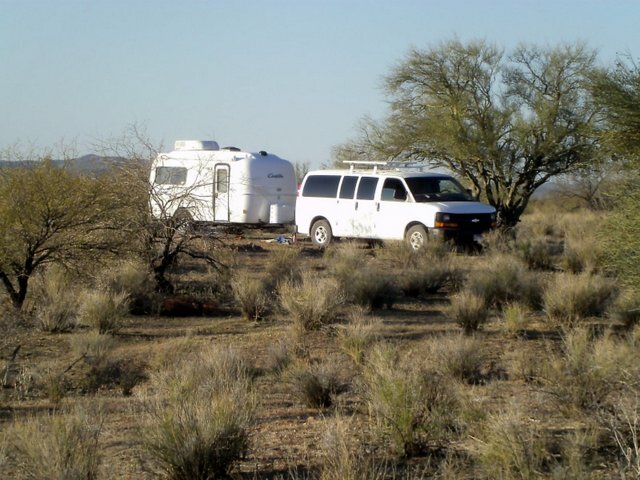 This entry was posted in Getting Ready To Go, Simple living and tagged Arizona, BLM, boondocking, camping, cattle, desert, fire restrictions, horses, rangers. Bookmark the permalink. The horses are gorgeous and look pretty well fed for eating desert grass!!! Take it easy with all those tough decisions, there is always mana~na !!!! Yeah, but Chuck, I gotta know what’s for supper .. . tuna fish or grilled chicken, tuna fish or grilled chicken . . . I don’t know what the horses are eating. I’m really stretching the definition of grass for what appears on the ground. I never see anyone around who might be feeding them. I wish I could have gotten a pic of the white and the roan. Really fun horses! Did you figure out who was good cop? and Tuna or chicken? Inquiring minds want to know! Hi, Kent! I’ll keep it a mystery . . . .
That ranger probably had you pegged as DB Cooper and was trying to see if the sacks of hijacked ransom money were buried under the ashes. Hm. Well, good thing you fooled him into thinking it was buried in someone else’s sock drawer..er, I mean ASHES. P.S. That reasoning makes about as much sense as seeing one dried and withered cut stick and pronouncing it illegal! DB Cooper? I haven’t heard that name in a long time! I don’t know what difference it would make if you stayed for two weeks or for two months… but I guess the Rangers have to do something. I love the pictures of the horses, and of course I always enjoy seeing pictures and hearing about the adventures of Spike and Bridgett. Hey, Mike! On behalf of the crew, thank you! I guess if people were allowed to stay in one spot for a long time they’d start getting possessive and there’d be border wars and homeowner association fees and who knows what . . . .
Calif did not enforce some of their time rules and they had hobo camps popping up in some of the more isolated state and county parks and had real hard time getting rid of them. Santa Barbara still had the problem when I left CA because of the do gooders. It is easier to enforce the rules than to have to chase off the bad guys. The fellow that bought my Casita, is a Santa Barbara Fish and game ranger and he told me some real horror stories, so don’t be too hard on the rangers…but good guy, bad guy?????? Your point is well taken, Chuck. It’s easy to forget that not all people are like ourselves . . . some throw litter around, smash beer bottles all over, trample vegetation (knocking over 100-year-old cactus), scar trees, make tire marks across previously unmarked ground, and so on. If it weren’t for fines and regulations — and rangers to enforce them — the slobs would rule and public lands and animal habitats would deteriorate. Just started following your blog very recently and I’m totally enjoying your adventures, vicariously. Just bought my own tow vehicle….picked it up yesterday actually… It’s a big deal to me because it signifies my commitment to following my dreams in 2 years and a few months when I retire. In the mean time I’ll enjoy your day to day adventures with your crew. Enjoy every minute, and thanks for sharing! Hello, Micky! Welcome to my blog! I know exactly what you mean about buying the tow vehicle. It’s a momentous step. I remember the day I bought the PTV. I felt like I was finally making things happen so my dream would soon be realized. I’m happy for you . . . There are wonderful experiences ahead for you! Thanks for letting me know you are with us and that you enjoy the blog. Good luck as you continue moving toward your goal. Apparently there is some kind of limit on how long you can stay in one spot…sounds like a hit or miss thing…surely they are not out there looking around every day? Happy camping and glad you are in such a nice location!! Bureau of Land Management land is free for camping, but you aren’t supposed to stay more than 14 days in the same spot within a 28-day period. You have to park somewhere else — 25 miles or more away, if I remember correctly — and then you can come back for another 14 days. Some places are very lax about enforcing the rule. I camped off the Darby Well Road for several weeks. I could be seen from the road, yet no ranger ever talked to me. No, you’re right. The rangers aren’t out here every day (especially since I’m the only one here in the middle of miles and miles of desert, excepting North Ranch). If I hadn’t been home I’m guessing they would have recorded my license plate and the date and checked back with me at a later time. Hope you enjoy your new home, our weekend excursions are getting closer and closer. Jim took GROVER out of the backyard and is begging the tasks of getting him ready to roll. www/tripswithtwo.com/blog/. PS – Love the horse photos, thank you for sharing them. GROVER? Grover the Rover? That’s so cute! 82*… Oh my! I wish…. Good for you, Bridget and Spike. I’m happy you were able to slide into Al and Kelly’s recently departed site. Thanks for your continued sharing of your living experience. I look forward to reading your updates. Thanks for sharing YOUR experience, Barrie. Nine inches of snow overnight. Snow plow sound. A very dim memory for me, but I do remember. And the ache for Spring to arrive . . . I hope she shows up soon so you can hit the road! Heh heh always seems to be one Dudley Do-Right Ranger in the bunch! Put a badge on a guy who has low self-esteem and he becomes a Big Deal. LOL Probably making up for his inadequacies in other areas if you get my drift. At least SHE was nice and pleasant and worked well with people. Can you imagine being HER and having to work with HIM all of the time? oh gosh! Maybe that’s why they each had their own pick-up! One thing I did think about both the rangers was . . . what a neat job, driving around looking for campers, posting signs, etc., rather than being cooped up in a cubicle staring at a computer all day, talking on the phone. Then I remembered Arizona summers . . .
badge and big gun,Talk about making up for other inadequacies. 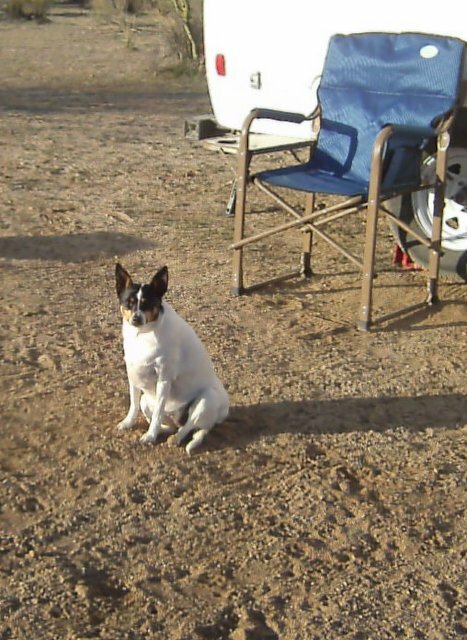 “skidded to a stop” — That’s exactly what Spike did when he saw his first cow when we camped in NM’s Lake Caballo State Park last fall. Poor Spike got a double-whammy that day. He saw his first horses, too. They were roaming inside the park. My next blog post I’ll write about another new creature for Spike . . . Don’t want to say now! G’mornin’ Sue! Glad to see Spikey is doing his best to keep you from getting mad cow disease! Good morning, Geri! You should see and hear Spike in action. His fur stands straight up like some punk kid’s hair and he barks so hard it lifts him off the ground . . . I think the cows are in danger of getting Mad Dog Disease! Seeing a herd of horses in open range like this . . . priceless! Guess the cattle are learning that not all dogs are like Pheebe. My concern is that with so many boomers (not to mention younger unemployed people) boondocking on public lands, Govie will feel the need to start cracking down… because oh-my-God… people are cutting sticks to build fires!!! or, living free while I (ranger) have to go to work every day, so I’m going to hassle the squatters. At least that has been our experience a couple times down in the Santa Rita’s south of Tucson. I understand your concern. There are so many people in rvs these days. Sounds like you’ve had some bad experiences with rangers. These rangers didn’t hassle me. I think the guy just needed to feel like he had a reason for driving out here. It is a good rule not to allow cutting though. You’ve probably camped or hiked in places and seen a tree that’s been turned into a twisted stump, struggling to survive having had most of its branches torn or cut off. It doesn’t seem a big deal when there’s a lot of trees around, but when I camped at Conchas Lake (NM) and other places like where I’m at now, trees are few and so precious. Don’t mean to sound like I’m getting on your case, Mark . . . I’m not! I do know exactly what you’re saying. There needs to be a balance between regulations and rights, and enforcement should be light-handed. Loved the pictures and the story. Your campsite is so beautiful. Horses, cattle, and even Rangers came to visit. Your day was very exciting with so many drop-in guests. Love that Spikey stands his ground even though he’s outnumbered and outsized. He has quite the threatening stance. Very cute. Hello, Karen . . . I was studying that photo of Spike and the cattle . . . Looking closely you can see how strained his muscles are. What a tough guy! Beautiful pictures, a perfect campsite. Wish we were there. Rain, sleet, snow here. NO SUN! The eastern slope or down south is calling. Would love to see the horses. Is there room for all us boomers down there! It is a worry. It seems though, as long as you avoid full hook-ups you can find space and peace, as you have Sue. Up here in the Pacific Northwest there are some bad feelings because the boomers are volunteering in the campgrounds for free, thus limiting the number of paid positions for the younger set. We hope to do some volunteer camping here in the future. It is a good way to have full hook-ups and explore the country a bit while keeping expenses down; especially during the winter, the best time to camp along the coast. Both sides of the issue are valid. Young people need jobs and older people need to cut costs. Every problem has a solution . . . haven’t a clue what the solution would be to that conflict! I used to think about a similar situation while teaching and considering retirement after 11 years. There were teachers with 30 years of experience who were well-set financially, who could have retired with a good pension, yet they kept teaching because they needed something to do. For heaven’s sake! Get out of the job market and let a newly certified teacher get a job! Let a young parent find work so she/he can provide for the family! You’ve had your turn! The parks situation, however, is much different . . . Parks need to keep costs down, and probably depend upon volunteer workers to keep parks affordable for everyone, young and old. Chuck and I love workamping in the summers. Most workamping jobs pay minimum wages after you have “volunteered” 20-25 hours to pay for your FHU campsite! You have free FHU and a few months to explore the area you are working in. This summer we will be working 12 miles from Zion NP! So it’s a win/win for boomers for sure, because most of the fulltime jobs are filled by younger workers at regular full time salaries! Thank you, Bob! I appreciate you thinking of me and the crew. I’ll watch the weather reports closely. Best of luck to you and yours in the high desert. Stay safe and close to the ground! 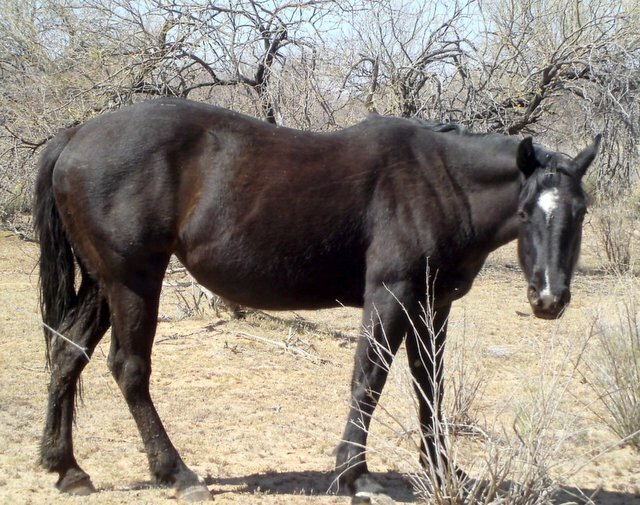 In the first picture of the black horse, he/she has a Bridget-like look on his/her face. Hey, Marsha . .. I scrolled back up to look at the black horse and had to chuckle. I do see a bit of that timid face! I agree, trees in the desert should not be “hacked.” I just think it was funny that he noted an old stick that had obviously been cut years ago. Keep up your blog, it is inspirational to lots of women who wonder if they could RV alone (no offense to the dogies). I don’t understand why women feel rving alone is difficult. Oh well, some do and I’m happy to show them the possibilities . . . I can imagine the rangers’ job description: “Knock on the doors of campers in a foot of snow and below zero weather to see if occupant is still alive.” Chinle, I thought the NM snowstorm I was caught in last fall in NM was bad . . . your story tops mine!